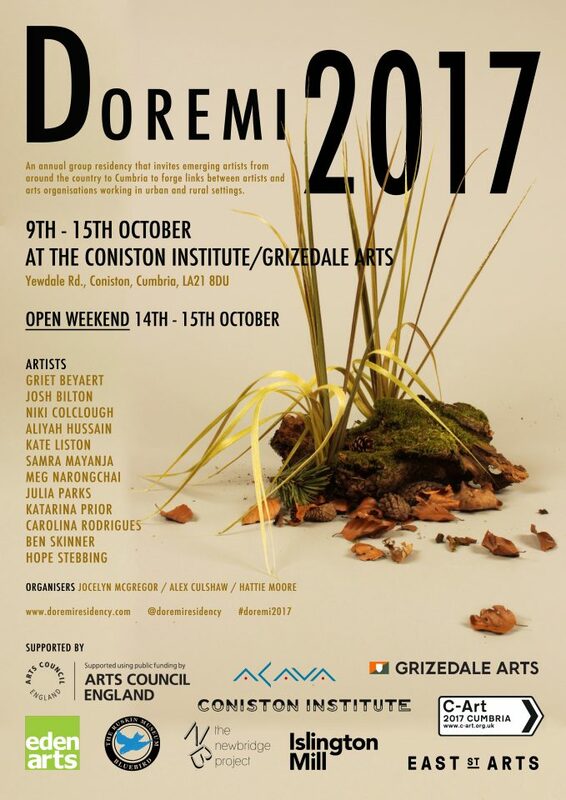 Hosted by The Coniston Institute and Grizedale Arts, with Village Table. ‘Doremifasolasido’ is an artist-led annual group residency that invites emerging artists from around the country to Cumbria to forge links between artists and arts organisations working in urban and rural settings. Each year artist participants are selected by partners from around the country to join the residency. During the week-long residency participating artists create work, ranging from sculpture to performance and film, in response to the site, culminating in a weekend of public events, including an exhibition of spoken word, screenings and artist critiques. As part of this year’s ‘Doremifasolasido’ at Grizedale Arts/The Coniston Institute there will be an evening of dinner and presentations for participating artists, inspired by the fast-paced presentation style of the original Japanese PechaKucha, or ‘chit chat’. The Doremi2017 PechaKucha will celebrate the rich and diverse artistic community in Cumbria past and present, and will include presentations from Glenn Boulter (Octopus Collective); Kaiwei Wang, Wei Yu and Nick Sawyer (Li Yuan-chia Foundation); Jenni Payne and Simon Walker (Florence Arts Centre & The Florence Paintmakers), Ian Hunter and Celia Larner (The Merz Barn) and Adam Sutherland (Grizedale Arts); with dinner from Village Table. From China to Taiwan: The pioneers of abstraction (1955-1985) Speech acts: Reflection-Imagination-Repetition. Manchester Art Gallery.